One of the things we love about Whole30 is how it helps people craft a new relationship with food, and cooking is a huge part of the journey. For many of us, Whole30 was what made us love pulling out the pots and pans, chopping vegetables and rolling up our sleeves in the kitchen. But what happens when you’re already a chef? And you’re cooking for hundreds of folks who depend on healthy foods as part of their recovery? 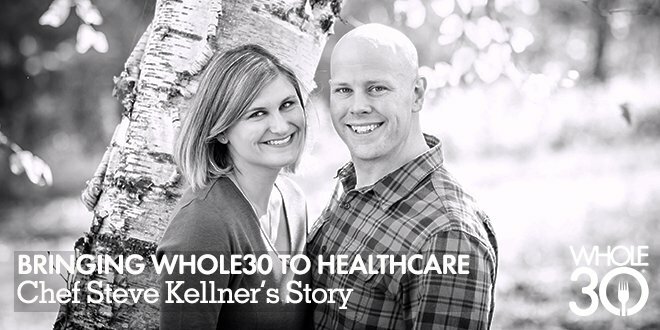 What if you could get Whole30 meals at the hospital? One VT chef is making it happen. Well, Steve Kellner has the answer. And it’s incredible. He took the words right out of our mouths. And, as Executive Chef at Mt. 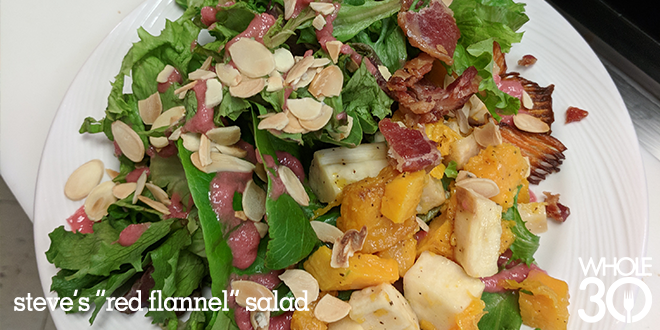 Ascutney Hospital in Windsor, VT, Steve is taking a page out of The Whole30 book (literally) to transform the hospital’s menu into something not only delicious, but helpful in healing. Steve was first introduced to Whole30 by his wife Elissa as the couple decided to embark on a bit of a wellness overhaul. They made meal plans together, shopped together (with Steve darting in and out of co-op aisles, searching for exotic ingredients) and cooked together. 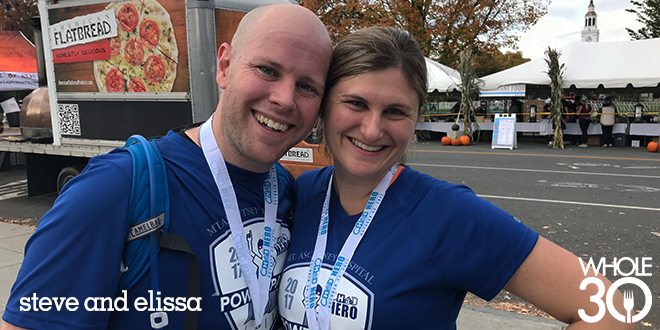 He says the experience was much more than just eating healthier—it brought them closer as a team. “After a hard day’s work and routine exercise, the recipes were easy to follow and flavorful, so dinners became something to look forward to. Cooking together while sharing a goal to eat more mindfully was only made more special by spending time with each other in the process. It was a wonderful,” Steve says. Now at Mt. 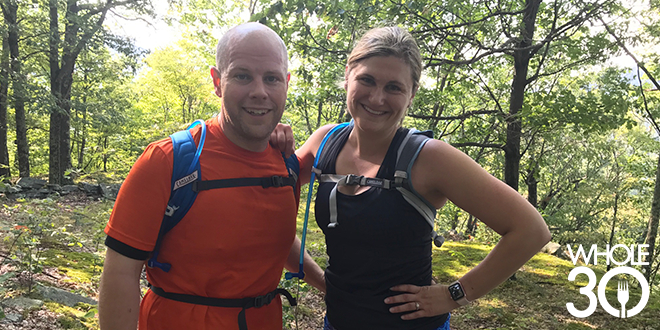 Ascutney Hospital, a place Steve calls “a brave little hospital in Windsor, VT,” he works with Nutrition Manager Sara Agnoli, R.N.D, to create comfort foods that were previously nutritionally out of reach. Things like chili (yup), BBQ (yum) and slaws (WE’RE IN) have found their way back on the menu. While it may not comprise the entire menu, the tools Steve picked up through Whole30 helped him bring these dishes to the table at Mt. Ascutney. Even more impressive, as the foods got healthier, they also gained a simpler ingredient list, which allowed more patients across a spectrum of diets to enjoy the regular menu. But it isn’t all about taste, Steve says. Again, it goes back to improving people’s lives through what they eat. He says the most rewarding part is when patients want to take the experience home with them and take charge of their health once they are released. We simply couldn’t have said it any better, Steve. PEEL and slice a small sweet potato wafer thin and reserve. Toss diced and peeled butternut squash and parsnip and toss in olive oil with a pinch of salt and pepper. Using the remaining oil in the bowl, toss the sweet potato wafers and roast on a cookie sheet in a 350 degree oven for 30 minutes or until roasted and tender. WHILE root vegetables are roasting, make dressing following instructions below. LAY sliced almonds on another cookie sheet and toast in oven for 5 minutes (or until golden brown delicious). SAUTE Bacon until crisp. Clean greens and drain. PLATE the salad by fanning the sweet potato frites on the plate. Place Greens on plate and drizzle dressing on top. Mix roasted squash, diced parsnip, toasted almonds and drape on greens. Drape with chopped bacon and serve. WITH the exception of the olive oil, combine remaining ingredients in a food processor and puree until smooth. Slowly drizzle in Olive Oil until emulsified (smooth). *Recipe Note: Whole30 compliant Dijon mustard can be difficult to find, but Annie’s makes a compliant version. You can also substitute another form of compliant mustard. Some links in this post are affiliate links, meaning we make a small commission via purchase made through these links. Thank you for supporting our Whole30 partners.